This lovely little watermill has records that date back to 1616 but is certainly very much older and was in use up until 1963. 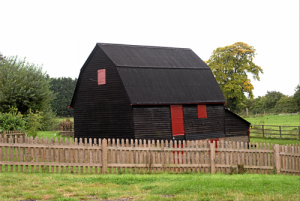 Restored by volunteers and maintained and run by Ford End Watermill Society, it is the only remaining working watermill in Buckinghamshire with original machinery. It retains all the atmosphere of a small farm mill of the late 1800’s. An unusual feature is a sheep-wash in the stream below the mill, washing made the fleece easier to shear and increased it’s value. Stone-ground wholemeal flour is on sale during milling demonstrations. Schools and other parties are very welcome. To make an appointment please telephone Mrs Jill Graves on 01296 660074. The watermill is open on certain Sundays and Bank Holidays between Easter and the end of September and can be found approx 600 metres from Ivinghoe Church along Station Road (the B488 towards Leighton Buzzard). Ample free parking.